The Rays Confidence Graph will appear every Wednesday and is a look at how much confidence Rays fans have in the Tampa Bay Rays. 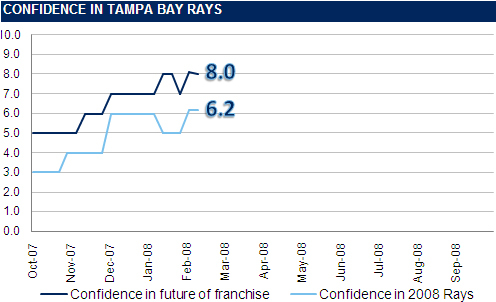 The graph is designed to give us a look at how our emotional bias as Rays fans fluctuates through time. The “confidence” in the team is an inexact measure of how we feel about the team’s current strength as well as how much confidence we have in the franchise for the next 3-4 years. You can think of a “confidence” rating of 10 as an indication that we believe the team is “playoff-caliber”. Notes on this weeks agida-level can be found after the graph.. Fans do not seem fazed by the new contract signed by Johan Santana and how that may affect the Rays ability to sign Scott Kazmir to a longterm contract.